Battery Park City’s South End Avenue is a short one, just five blocks long between Liberty Street and West Thames. But it’s an overly wide one, too. That leads to speeding, illegal parking and U-turns, and what has become a long history of complaints by residents that the street along these residential blocks is dangerous and pedestrian unfriendly. Now there is a plan that may finally bring those worries to an end. Efforts to fix the street’s problems, which also includes the wide West Thames Street, go back five years, when the city Department of Transportation offered a traffic calming and street beautification plan for South End. 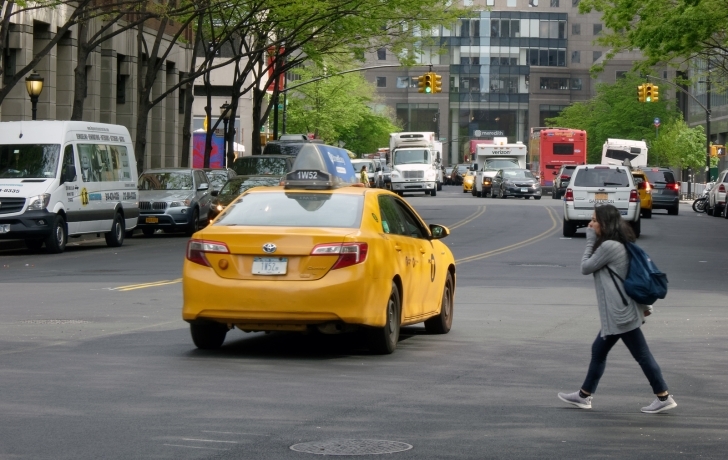 Some of the measures were implemented but others were put on hold while The Battery Park City Authority looked to conduct a more comprehenive review of potential streetscape improvements. Some of the concepts that resulted from that $270,000 design study in 2016, which included a refashioning of the covered ground-floor building fronts, proved unpopular. Now comes a third plan, presented to Community Board 1’s Battery Park City Committee last week before a standing-room-only audience of residents. The proposal, devised by the Battery Park City Authority with consultants Stantec and the city’s Department of Transportation, appears to have a good chance of community acceptance. But it has yet to be finalized. The diagrams below show some of the current condition and proposed changes for South End Avenue and West Thames Street. • Extended curbs (red) along the west side of South End Ave, and on the north side of West Thames. Curbs would have crosswalk “bulb outs” on both sides of South End to shorten the crossing distance. • Planted medians (green) are proposed between Liberty and the garage entrance to Gateway Plaza, and between Albany and Rector and Rector and West Thames, as well as the South End Avenue cul-de-sac. According to the authority, medians increase the use of crosswalks (and reduce jaywalking). Along with the narrowed roadway, they would be expected to slow traffic and eliminate truck parking in the middle of the street, which creats blind spots for drivers. There would instead be designated spaces and times for loading and unloading. The authority is also proposing some changes for cyclists. The neighborhood’s two Citi Bike stations would be moved. The one at the Liberty ramp, near the north end of South End Avenue, would relocate near the West Street bike path, where riders are more likely to want to ride. And the station now in the middle of West Thames Street, which is seen as a safety hazard, would move onto what is proposed to be the widened West Thames sidewalk near West Street. An eastbound bike lane would be added to Liberty Street, between South End and West, and arrows (shown in image above) indicating a shared street with cars would mark the southbound lane of South End Avenue. Before a final plan is reached, the public will be invited to walk the street with Battery Park City and DOT officials in late May or early June, said Tammy Meltzer, chair of CB1’s Battery Park City Committee. “Because what you see [in the meeting] versus what you experience on the streetscape is sometimes very different.” The goal, she said, is to come to a consensus on a plan by July for the community board to approve.